It occurred to the editors of Ibo that there was one basic question, so fundamental to the Christian life, that it demanded to be explored for greater profit of both ourselves and our faithful readers. Quite simply, the question was this: What are the ways Christ promised to be with us? “That’s so obvious!” the reader might cry. Perhaps. But it is nonetheless an important question. Unless we know the primary ways of encountering the living God in the bracing reality of our lives, the faith risks becoming an abstraction at best, an ideology at worst. There are four privileged ways we know of in which Christ manifests himself to his people in the here-and-now. Four writers are exploring these in a series of four short articles. The first was here. This is the second. Of the four topics that we Ibo contributors intend to cover in this series, I consider the Eucharist both the easiest and the toughest. Due to its importance, much ink has been spilled on this topic since the early days of the Church. 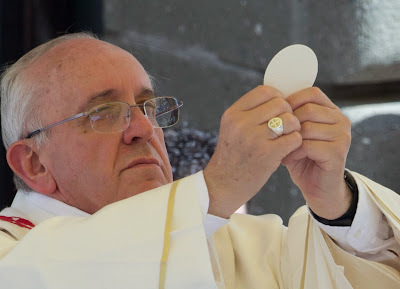 For Catholics, receiving the Eucharist is one of the most recognizable “things” that we do; for non-Catholics, this is easily the biggest scandal of them all. Given the limits on time and space, I simply wish to address three points in this blog entry: its scriptural roots; the role of our perception of reality; and the aspect of communion. There are two passages in scripture where the discussion on the Eucharist often takes place. First, there is the bread of life discourse (Jn 6: 22-71), and the institution of the Eucharist at the Last Supper in the Gospels. The discourse from the sixth chapter of the Gospel of John is highly interesting from a purely human standpoint. There, we have Jesus proclaiming one of his most difficult teachings of all: I am the bread of life, and whoever eats this bread will live forever. The Jews were scandalized. It wasn't as if they were pretending to agree with Jesus with a polite smile while questioning him in their hearts; they were openly murmuring among themselves about this controversial teaching. This rabbi is promoting cannibalism. Surely, he intended this in a symbolic way? If Jesus intended this to be symbolic, then he could have clarified his comments. Instead, Jesus made it even tougher to swallow by emphasizing the flesh and blood aspect: “Amen, amen, I say to you, unless you eat the flesh of the Son of Man and drink his blood, you do not have life within you. Whoever eats my flesh and drinks my blood has eternal life, and I will raise him on the last day. For my flesh is true food, and my blood is true drink.” (Jn 6: 53-55) Even his disciples found it difficult to accept, and many left Jesus because of it. So much for pastoral sensitivity. A similar dynamic can be observed at the Last Supper, when Jesus proclaimed that the bread and wine shared at the table were his Body and Blood, to be given up for us. Again, we can avoid the controversy by reading it in a symbolic way, but Jesus did not. The heart of this controversy is whether to consider the bread to be his biological flesh, or to be his symbolic body. This points to my second point: how we perceive reality. In his book God is With Us: the Eucharist, the Heart of Life, Pope Emeritus Benedict XVI thinks that we swing between considering the bread as literally the flesh of Jesus (which he calls “naive realism”) and a symbolic saying (or “reductionism”) because of one thing: we can only consider reality from a material perspective. Therefore, it either carries the DNA of Jesus or it merely carries the deeper meaning of representing the body of Jesus in a symbolic way. Neither explanations are correct, and we need to consider reality on another level. To do this, we shift into another gear by using terms that we may not be as familiar with: form and substance. I am Edmund. My appearance (or form) changes: like fine wine, I may become more and more handsome with age, or I may wrinkle up like a raisin. But it doesn't matter whether I am young and lively, or old and decrepit. This does not in any way change who I am as Edmund. I am still the same person. This fundamental reality of a thing, what it is in itself, is called substance. It is not substance understood in a material way. With this in mind, we can better appreciate what the Church calls transubstantiation. It is a transformation on the level of substance. Materially speaking, the chemical compositions of the bread and wine remain as they are. It is the fundamental reality behind the bread and wine that is changed into the Body and Blood of Christ. Again, this is not a change in what the bread and wine means to me and you; it is a change in the fundamental reality of what the bread and wine are in themselves. Given the dominance of the scientific worldview, we understand the world primarily as physical and material. I know this very well, given my training as a neuroscientist. I don't consider it as a form of regression to understand the Eucharist from the form/ substance perspective. Ultimately, the question is whether reality can only be perceived from the materialistic perspective. Can we break out of this constraint in our minds? It is worthwhile to ask ourselves this challenging question. In Christian theology, Christ draws us to himself. We are in turn united with him, and also with all those who are likewise drawn to him. This great mystery of communion can be understood at an intellectual level, but the Eucharist truly brings its significance to the fore. I used to think that when I receive the Eucharist, I am incorporating Jesus Christ in me in a substantial way. Great minds think alike, and apparently St. Augustine also shared a similar sentiment. Then, as always, the Lord enlightened St. Augustine with a greater truth: “You will not transform me and make me part of you; rather, I will transform you and make you part of me.” Jesus Christ wishes to be and remain with us through the Eucharist in a physical way; he also wishes to bring us into a greater communion with him and with those whom he has drawn. This is why the way we are to understand the Church is primarily eucharistic: by sharing this bread of heaven together, Christ brings us all together in a communion of saints. As it was in the beginning, is now, and ever shall be. Lost, all lost in wonder at the God thou art. And I pray the prayer of the dying thief. Daily make me harder hope and dearer love. There be thou the sweetness man was meant to find. All the world forgiveness of its world of sin. And be blest for ever with thy glory's sight. Amen. Thanks Edmund! I love the analogy that you use of your young and aged self. It really makes the point clear and brings a smile to my face too!